2 Arlington is located on the west side of Arlington, between Beacon and Marlborough, with 1 Arlington to the north and 3 Arlington to the south. 2 Arlington was designed by architects Gridley J. F. Bryant and Arthur Gilman, and built ca. 1860, one of three contiguous houses (1-2-3 Arlington) built for clothing manufacturer and real estate investor John L. Simmons. Click here for an index to the deeds for 2 Arlington. On June 7, 1862, 2 Arlington was purchased from John Simmons by Anne Shepard (Wetherell) Faulkner, the wife of dry goods merchant Charles Faulkner. They previously had lived at 38 Summer Street. Anne Faulkner’s mother, Mrs. Ruth Wetherell, the widow of John Wetherell, lived with them until her death in July of 1881. Charles Faulkner died in September of 1885. Anne Faulkner continued to live at 2 Arlington until her death in June of 1901. On February 7, 1902, 2 Arlington was purchased from the estate of Anne Faulkner by Dudley Leavitt Pickman and William Stuart Spaulding. Dudley Pickman was an investor and trustee. He and his wife, Ellen Rodman (Motley) Pickman, lived at 98 Beacon. William Spaulding was agent for, and later president of, the Revere Sugar Refinery. He was a bachelor and lived at 99 Beacon with his mother, Emily (Smith) Spaulding, the widow of Mahlon Day Spaulding (William Spaulding married in September of 1909 to Katrina Fairlee) . Dudley Pickman and William Spaulding continued to own 2 Arlington until 1921. The property was not listed in the 1902 and 1903 Blue Books, and by 1904, had become a mixed commercial and residential building. Among the commercial tenants were Miss Lucretia T. Colby, dressmaker, (from 1904 to 1911), who lived in Newton, and her brother, Thomas Parker Colby, who lived in Dorchester; Esther F. Morrill, a dealer in linen goods, and O’Hara and Livermore, art goods. Also maintaining offices there were physicians Dr. Marsena P. Smithwick (from 1907 through about 1911), who lived in Lexington, and Dr. Robert G. Loring (in 1909 and 1910), who lived in Cambridge. During the 1909-1910 winter season, in addition to the commercial tenants, 2 Arlington also was the home of Mrs. Jessie W. (Patch) Johnstone, the widow of George M. Johnstone, who had been a merchant in Campobello, New Brunswick. She previously had lived at the Hotel Hamilton at 260 Clarendon. 2 Arlington was not listed in the 1912-1914 Blue Books. 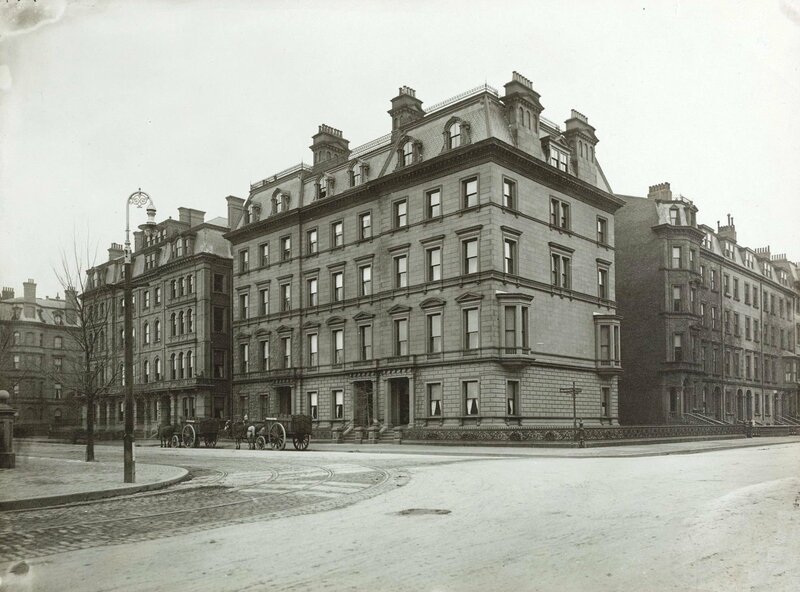 By 1912, 2 Arlington was the home of Mrs. Myra E. (Allen) Stanley Stearns, the former wife of John H. Stearns, who probably operated it as a lodging house. She previously had lived at 45 Mt. Vernon, where she operated the Hotel Curtis, and prior to that at 23 Marlborough. She continued to live at 2 Arlington until her death in May of 1913. By the 1914-1915 winter season, 2 Arlington was the home of Mrs. Clara R. (Griffin) Barrett, the widow of Samuel G. Barrett, who operated it as a lodging house. 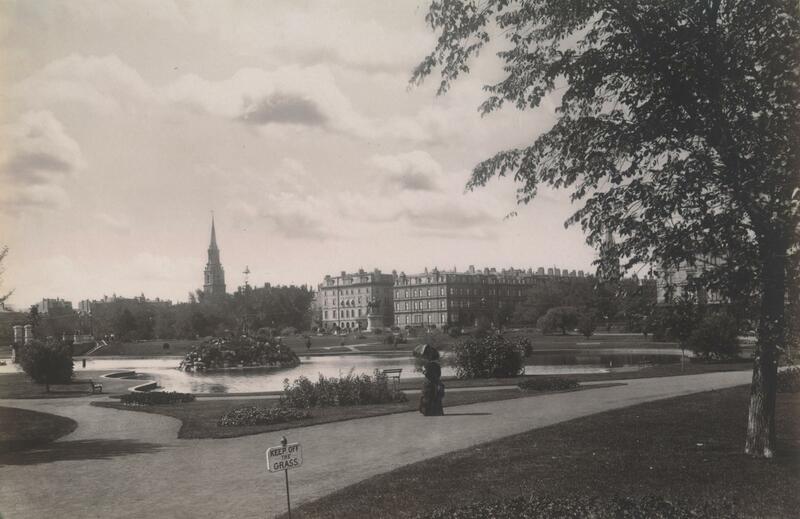 She previously had lived at 14 Newbury, where she also had operated a lodging house. On June 20, 1921, Clara Barrett acquired 2 Arlington from Dudley Pickman and William Spaulding. She continued to live (and operate a lodging house) at 2 Arlington until about 1935, when she moved to Dorchester. On November 5, 1945, Clara Bartlett sold 2 Arlington to the Institution for Savings in Roxbury and Its Vicinity, probably in lieu of foreclosure of their mortgage to her. The property continued to be operated as a lodging house, with various operators. On May 5, 1944, 2 Arlington was purchased from the Institution for Savings in Roxbury by Joseph J. Diab. He and his wife, Dorothy H. (Bancroft) Diab, lived at Brimmer Chambers at 112 Revere, where he was the building superintendent. His brother, Thomas J. Diab, was a real estate dealer and developer. In October of 1945, Joseph Diab applied for (and subsequently received) permission to convert the property from a lodging house into six apartments. On February 28, 1946, 2 Arlington was acquired from Joseph Diab by William Powers. He sold the property the next month, on March 5, 1946, to Susanna M. Josephine (McNamara) Cassidy Regan, the wife of James Bernard Regan, and Anna Louise (Day) Hicks, the wife of John E. Hicks. 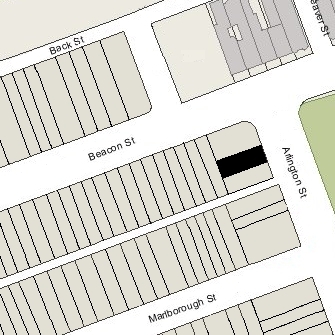 James and Susan Regan lived at 424 Beacon, where they operated a lodging house. James and Anna Louise Hicks lived in South Boston. A real estate investor and operator of lodging houses, Louise Day Hicks later would become an outspoken opponent of using busing to integrate Boston’s schools. In 1967, she was an unsuccessful candidate for Mayor, but in 1969 was elected to the City Council. In 1970, she was elected to the US Congress, but was defeated for re-election in 1972. She was elected again to the City Council in 1973 and 1975. On December 31, 1947, 2 Arlington was acquired from Susan Regan and Anna Louise Hicks by architect Thomas Byrd Epps and his wife, Margaret Killeen (Lonval) Epps. They lived at 1 Otis Place. In May of 1951, he applied for permission to convert the house from six apartments into five apartments and a “decorating shop” on the first floor, selling “fabrics, home and garden furniture and equipment, etc.” The application was denied and his appeal was dismissed by the Board of Appeal in July of 1951. In the spring of 1951, the Eppses purchased the Gray Gables Inn in Bourne, a hotel and restaurant in what had formerly been the summer White House of Grover Cleveland. On August 27, 1951, 2 Arlington was acquired from Thomas and Margaret Epps by Francis H. Farrell and Byron R. Switzer, trustees of the Commonwealth-Newbury Mortgage and Real Estate Trust. In June of 1957, they transferred the property to themselves as tenants in common. On May 3, 1961, 2 Arlington was acquired from Francis Farrell and Byron Switzer by John Stanley Ames, Jr. A lawyer by training, he was a trustee of his family’s real estate investments. He and his wife, Marie Eleanor (Righter) Ford Ames, lived in North Easton and maintained a Boston apartment at 2 Arlington. On October 23, 1979, 2 Arlington was purchased from Eleanor Ames by Joseph Schena and Mary E. Schena, trustees of the Two Arlington Street Realty Trust. 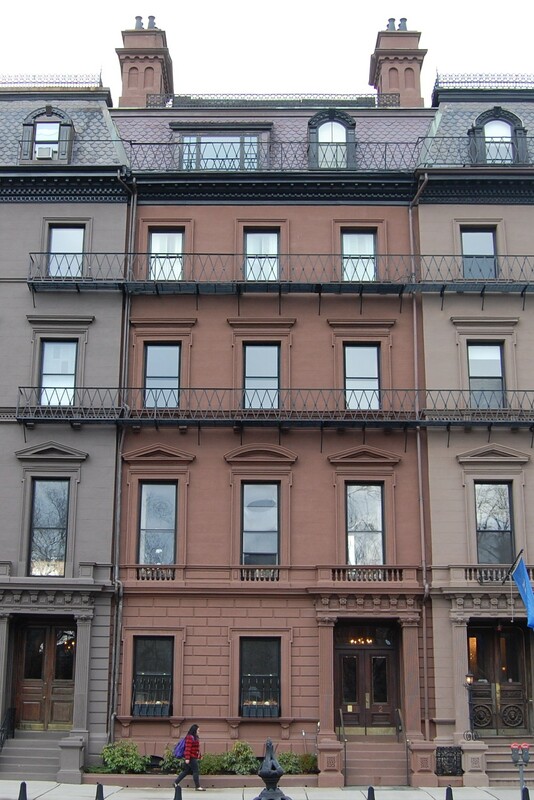 On November 28, 1979, they converted the property into six condominium units, the Two Arlington Street Condominium.